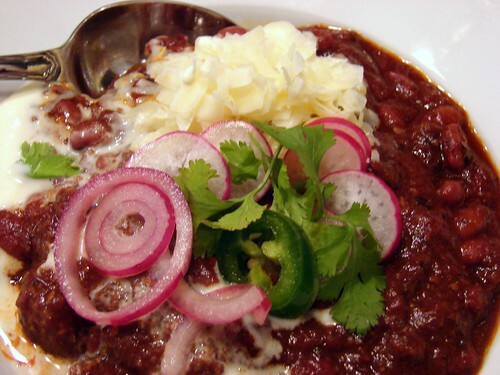 We love a good pot of chili, and our kitchen has turned out dozens of variations over the years. Mike is partial to a meaty, Alton Brown-style version, while I tend to favor a chili with lots of beans and sometimes no meat at all. 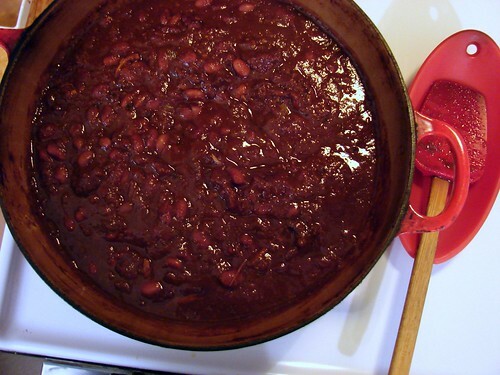 With the weather turning colder I decided to make chili my next project, and set out on Sunday to come up with a version that would satisfy both of us. For the meat, I used Aquidneck Farm beef short ribs, boned out, trimmed, and cut into chunks. I made a puree of chiles and spices, added fire-roasted tomatoes and some rich dark beer, and let everything cook low and slow for the better part of the day. I added some crushed tortilla chips for texture and a hint of toasty corn flavor, and a hit of fresh lime juice at the end for brightness and balance. And after my pot of chili had cooked for the better part of the day, I cooled it down and let it sit overnight. We ate it on Monday with a bevy of garnishes, and I have to tell you, it was so worth the wait. You can get my recipe at food52. That does indeed look awesome, and I like the idea of crushing up some tortilla chips for flavor – thanks for the suggestion!